I have a slight obsession with zucchini. The lady at the Farmer's market recognizes me as the "girl who keeps buying all the zucchini's". She gave me a free bag of apples this week. Maybe she thinks I need to eat something other than zucchini. Well, other than baking and making relish, I have been chopping and freezing a ton of it for my smoothies. I can't have banana (damn, damn, double damn) because of my food sensitivities and the fact that I'm still on the Candida diet which excludes fruit. So I put frozen zucchini in my smoothie. Every morning. And guess what..... I like it. But this week I decided to do some more experimenting (i.e. 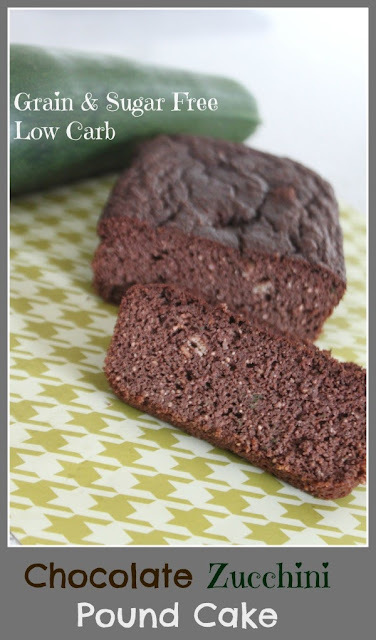 trying to find sweet snacks and treats that are legal on the Candida diet) and I came up with this chocolate zucchini pound cake. And guess what..... I liked it. I used almond and coconut flours to keep it grain free and low carb. I did add a bit of yogurt as I'm introducing it back into my diet. If you are avoiding dairy I would just sub it out for full fat coconut milk. It should work. And you can always shred it and freeze it for some fall baking..........or for a smoothie perhaps. This was delightful! Thank you for posting.